We are open 10.00 - 16.00 every day except Wednesday. Sunday is 11.00 - 16.00 outside school holidays. Check out our Sale Items & Gift Ideas page. Next day delivery in the UK. High Tide: 24th April 12.22 (4.1m). This surf report relies on website sales to keep going, please consider us when next buying online. Use it or lose it. Porth Neigwl (Hell's Mouth) Surf Report: There was still a light easterly breeze this morning. There was still a hint of swell at low tide. Waves were generally less than knee high. There has been an increase in surf down south but this is from a big northwest swell. The LIVE Webcam updates every 5 minutes. Surf Forecast for the rest of the day: The wind is forecast to remain light to moderate east to southeast this morning. The higher tide should allow a bit more swell through and those couple of hours as it draws back should, once again, provide the bigger waves. The wind is forecast to veer south or southwest (the first time for 15 days) and increase early this afternoon. The sea may become messy. The water will be very cold until mid June (then just cold). 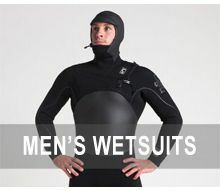 We have plenty of 5mm wetsuits which are perfect for surfing most of the year. 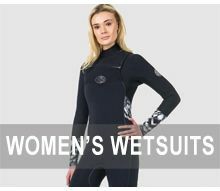 The E-Bomb Zip Free 5 x 3 mm Rip Curl Wetsuit is the ultimate flexible and warm combination. NOW REDUCED. Outlook For Surf: There is a complex area of low pressure to our southwest. There isn't a lot of southerly push. Short period southerly swell may begin to form as the depression nudges northwest. Thursday: The wind should back again into the east. This is ahead of another front moving north. The wind should veer south or southwest behind it again. There is unlikely to be much increase in swell but residual, short period, southerly fetch waves may provide some peaks before the wind veers. Friday: It is difficult to forecast a wind direction with the depression centre likely to be in the Irish Sea. There should be an increase in agitated sea state though. Quick Guide: Thursday: am: Fair, pm: Poor. Friday: am: Poor, pm: Poor. The Quick Guide is a subjective appraisal by West Coast Surf Shop of the surfing conditions at Porth Neigwl (Hells Mouth). Poor surf may be perfect for our surf school and beginners. It is based on surface conditions more than wave size because, in our opinion, a clean waist high wave is far better than a wind ravaged overhead one. It does not reflect conditions on other beaches which could be perfect while Porth Neigwl is Poor. There are 3 quick descriptions: Good, Fair, and Poor. Good surf could be anything from knee high to well overhead so there may be times when beginners and less confident surfers still need to look elsewhere on the Peninsula for suitable waves. Opening Times: We are open every day 10.00 - 4.30 (5.00 in Summer) except Sunday 11.00 - 4.30 and we are closed on Wednesday outside school holidays. During good surf we may be a little late in. Call us if unsure 01758 713067. We do not let hire go after 1.00pm as all hire equipment needs to be returned by 4.30pm - unless you are having it for a few days. Please note we can't do surfboard hire to under 18's or when the wind is stronger than force 6 - fresh to strong. We are restricted to one board per adult. Don't forget that the tide plays an important role in wave quality and size at Porth Neigwl.